The Spring rains and warm temperatures gave the gardens a lot of growing power. So this week we've continued with the vibrant greens and added a few new things still in their infancy (pea shoots and micro greens). We have flamenco chard, "giant" chard, mizuna, collards, Tatsoi, Red & Green Russian Kale, some fabulous lettuces: Bronze Beauty, Grandpa's Admirer, and Red leaf. We have fresh eggs as well as parsley, mint and cilantro. 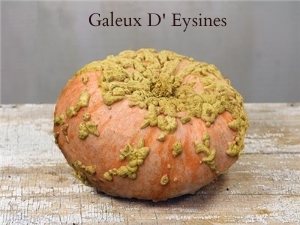 I also added a homemade soup made from the last hurrah of our French winter squash— the Galeux D' Eysines (also known as "warted sugar marrow") and flavored with new shoots of green garlic. This soup is vegetarian based & made with a vegetable broth of Bloomfield, onions, fennel and herbs. Serve hot with grated parmesan, a bit of green, peppery olive oil and a crusty bread. Each week you've been getting different types of mizuna in your salad mix. So this week I decided to give you another option for this mild Japanese mustard green. (In Japan, the green is not usually eaten raw —instead, it's pickled, stir-fried, simmered, and added to soups). Wash and drain mizuna. The greens do not have to be completely dry. Roughly chop into 2-inch segments and set aside. Place a wide and shallow frying pan or wok over high heat. Add two tablespoons of oil. Add the crushed garlic and stir around for 5 or so seconds. Add the greens to the wok or pan and saute for a few minutes, stir around constantly. The mizuna should be softened. Add the salt and distribute evenly. Garnish with a squeeze of lemon, zest and freshly ground pepper. Serve warm or tepid. You can also add walnuts and parmesan to give it an Italian bite. Or keep it Asian and add fish sauce to the mix.